“O Maata! Yashoda! Your Son came to our house and realized that there was not enough ksheeram (milk) for him. With great anger, pushing away small babies in the house, he came out. The babies cried a lot. O! Yashoda! you are also a mother. Cant you understand our pain”? 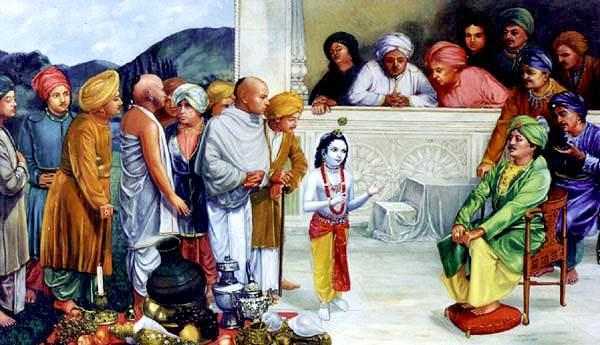 Through this Story, Shri Krishna Paramaatma taught us about an important Gruhastha-dharmam. Gruhasthas must not only do poshana (look after) of their santhaanam and kutumbam (children and family) but also satisfy the needs of who come to their Gruham (house). Especially they must be in a position to satisfy basic needs of baalakas (kids), Vruddhas (the aged), atithis (guests) and arthis (the needy) who come to their house. If not done, it will lead to Vamsha-naashanam. The Gruhastha in the story took care about the needs of his kids but did not have enough milk to give to kids, who are considered to be Bhagavat-svaroopams, coming to his house. Hence Baalakrishna punished them as told in the story (and thus saved them). For exactly the same reason, our elders advise us never to have important things like dhaanyam (rice/wheat), haridraa-chuurnam&kumkuma (turmeric and kumkum), dadhi-ksheeram (curd-milk) etc. empty in the house. Infact, in Bhaarateeya bhaashas, we never say these things are “empty”. We always say they “need to be filled”. Their intention was that such basic utilities should never be empty. In olden days, people used to always leave little food and never empty the food vessels by consuming everything, so that any needy can be fed if required. Thus the upadesham of Jagadguru Shri Krishna is that we must always keep the needy who come to us in mind and have the basic utilities enough for them also. Bhaarateeyas always respected Nature and their fellow living creatures. Bhuuta-daya was the foremost in our Saampradaayam. Infact they do puuja of Prakruti assuming its Parameshvarii’s ruupam. Gopaalakas used to every year do Indra-yaagam. Seeing this Paramaatma, Shri Krishna, who then was 7 years old, said “O Nandaraaja! What is the reason behind doing Indra-yaagam”? Nandaraaja replied “Krishna! Yagnya-yaagams are a way of showing Krutagnyata. We show our Krutagnyata to Devatas, Devendra. A Krutagnya only deserves help and not a Krutaghna. Hence if we do Indra-Yaagam, Devatas will help us, leading to Loka-hitam”. Nandakishora replied “Devatas alone do not give Phala-siddhi. One’s Karma (what good and what bad he did) is the main reason for Phala-siddhi. Hence one must always follow his Sva-dharmam. With Bhagavat-bhakti, Dharma-kaaryams must be done. This Prakruti is what we see directly, and Paramaatma, Devendra, Devatas are who we cannot see. Hence leaving this Pratyaksha-daivam, Prakruti, is not correct. We all live under this Govardhana-giri. For us this Govardhana and Gomaatas are Pratyaksha-daivams. Gomaatas, Viprottamas, Saadhus, Vedams are all Puujaniiyam. This Pavitra Govardhana Giri came from Mahaavishnu’s Vakshasthalam and brought here by Pulastya muni. Hence let us do pooja of this Govardhana giri and Gomaatas. This is My abhimatam (wish)”. Sannanda, one of the greatest Vruddhas replied “Nandanandana! What You spoke are Amruta vaakyams. You are Gnyaana-svaruupa, Paramaatma. Your words are Shirodhaaryam for us (must be followed by us). Please tell us how to do Govardhana-giri puuja”? Paramaatma replied “Taata! We must clean the bhuu-bhaagam near the Giri-paadam, purify with Gomayam. Then must put beautiful Rangoli on it. With all puujaa-dravyams, we must do Shodashopachaara pooja as told in Shaastrams. Abhishekams must be done with Triveni-sangama-jalam, Go-ksheeram. After Deepaaraadhana, we must do Giri-pradakshinams and Namaskaarams. We must then do Naivedyam. After Neeraajanam, we must do Go-puuja and then do many Daanams”. Every one became enthusiastic. They were longing to start the Giri-puuja. Shri Krishna then continued “before coming for puuja, do all your Kartavyams (duties) and then only come. Do not leave Vruddhas hungry in the house and come. Feed the Vruddhas, baalakas first. Feed the Gomaatas, pashu-pakshis (cattle, brids), Shunakams (dogs), other domestic animals and then come”. On a Shubha-vaasaram, all Gopaalakas did as told by Shri Krishna, decorated themselves, Gomaatas and came in huge numbers to do Govardhana-giri puuja. Nandaraaja, Yashodaa Devi, Rohinii Devi, Balaraama-Krishna, Garga Maharshi came. Navanandas and Vrushabhaanu brought Raadhaa Devi in a Suvarna-aandolika (golden palaquin). Devatas, Apsaras, Raajarshis, Maharshis many came. Paarvatii-Parameshvara also came to see the Divya-puuja. After puuja, Govardhana Giriraaja appeared with Chaturbhujas and gave His anugraham to the Vraja-vaasis. Everywhere people were shouting “Jayaho Shri Krishna Paramaatma, Jayaho Govardhana Giriraaja”. Destroying Natural resources, Nature was never Bhaarateeyata. They infact used to do puuja of Prakruti assuming it as Aadi-shakti. This was well shown in the story through the words of Shri Krishna. Bhaarateeyas also believed in Bhuuta-daya. As Shri Krishna said, Bhuuta-daya is one of their Kartavyams. Shri Krishna asks Gopaalas to feed Vruddhas, Baalakas, other domestic animals and then only come for pooja. The Amruta-vaakyams of Shri Krishna must never be forgotten. One must never leave his Sva-dharmam. Raamayya was an ordinay farmer. He used to treat his Vrushabhams, with the help of which he used to do Vyavasaayam, like his own putras. Like other Bhaarateeyas he used to do pooja of Dhenu-Vrushabha sampada. The Vrushabhams of Raamayya were special. They were of the variety ‘Naagour’; hence have a lot of strength. His Vrushabhams used to run very fast. They used to be faster than good quality horses too. Raamayya always had Santrupti and was happy with whatever God gave him. One day some Chorakas stealed the Vrushabhams of Raamayya. There was not end to the duhkham of Raamayya when he came to know about this. He cried saying “Raama! What is this Vidhi-vaipariityam? Why are You testing me like this? How can I live without my Pashu-sampada? I would have been very happy if the robbers took away all my Dhanam and left the Vrushabhams for me. Will Lakshmii Devi stay in a house where Pashu-sampada is not there? (no)” Having great duhkham, he ran to the nearest Police-station to lodge a complaint. He also went along with the Police to search for the Vrushabhams. At last, to the joy of Raamayya, they traced the robbers who were running away with a cart pulled Raamayya’s Vrushabhams only. There was no end to the aanandam of Raamayya seeing his Vrushabhams. The police and Raamayya were chasing the robbers on horses and the thieves were going on the bullock-cart. Raamayya who very well knew the strength of his Vrushabhams saw that they were not running at full speed and hence the horses were able to approach it. He was not able to bear the fact that if they catch the robbers then his Vrushabhams will loose to the horses in race. He thought his Vrushabhams must never loose! They must always win!! “Arya! My Vrushabhams never lost to any horse in race. The Pratishtha of my Vrushabhams is more important for me than they being with me. With whom ever they will be, they will be winners. That satisfaction is enough for me”. Seeing the Bhaarateeyata in Raamayya, the Police did Namaskaar to Raamayya. The respect what Bhaarateeyatas used to give for domestic animals is well shown by Raamayya. He overcame his teevra-duhkham just seeing his Vrushabhams win! Gomaata, Vrushabhams and sakala Pashu-sampada was always given great respect in Bhaarateeya Samskruti. From the ages of Diliipa, Shri Krishna through the times of Raamayya (which is not even 60 years ago), now we are in an age where just for money people are exporting the cattle to foreign countries where for flesh the animals are killed. Breeds like ‘Naagour’ have demand for flesh hence just for money, not caring for Bhaarateeya Samskruti people are exporting the cattle. It is very sad, heart-breaking to see such Krutyas happening in Pavitra-Bhaarata-desham. Chaanuura-Mushtika announced “we have bala-paraakramam. It is not wrong if we show it to Balaraama-Krishna”. Paramaatma replied “O Yoddhas! We are baalakas. You are Mahaa-balas. Will the people accept this adharma-yuddham”? Chaanuura replied “You are not a baalaka. You are a Mahaa-bala in baalakas. You did Vadha of Kuvalayapeeda. So this is Dharma-yuddham”. With Chiru-mandahaasam, Balaraama-Krishna accepted for Yuddham. Nagara-vanitas thought “This is not Dharma-yuddham. Kamsa cannot escape punishment for doing such an akrutyam. If we have any adrushtam, may Balaraama-Krishna win the Yuddham”. Everyone wanted Balaraama-Krishna to win. Ghora-yuddham started. They were hitting, fighting, jumping, throwing each other. However Balaraama-Krishna always had chiru-mandahaasam on their face. Paramaatma hit Chaanuura hard. Chaanuura then hit hard on the pavitra Vaksha-sthalam of Shri Krishna. Nothing happened to Paramaatma. He took Chaanuura by his shoulders, swirled and smashed hum onto the ground. Chaanuura lost his life. Balaraama svaamy gave a hard mushti-ghaatam on the back of Mushtika. Bleeding, Mushtika died. Brothers of Chaanuura-Mushtika then attacked Balaraama-Krishna and got killed. The Tejas of them entered Paramaatma. The claps (Kara-taala-dhvani) of the praja reached the skies. In Amaraavati nagaram, there lived a Bhuusurottama by name Udandha. He had 5 putras. They didnt listen to the hita-vaakyas of their Maata, Pita, didnt follow aachaaram and started to learn how to use aayudhams, do Yuddham. Udandha said “O dushtas! We are Vipras and hence must always have Shaantam, Daya and do Tapas. In addition to leaving these, you took to Para-dharmam. All 5 of you be born as asuras and become Yoddhas”. After they had pashchaataapam, Udandha said that they will get Vimukti after fighting with Shri Krishna in Dvaapara-yugam. Durgunam to be unlearnt: Not respecting Maata, Pita and not following Svadharmam and Sadaachaaram. Aayurvedam is the Bhaarata-desha Vaidya-vidhaanam. Before “Allopathy” came, in Bhaarata-desham, Aayurvedam was famous. The English occupied our land and they introduced their Vaidya-vidhaanam. With that, Aayurvedam got lesser and lesser importance. However, some still used to do Prachaaram of Aayurvedam. Challenging the English medicines, Deshi medicines were manufactured. One of the persons who did this effort was a Prasiddha Vidyaa-vetta from Bengal. He established an industry for manufacturing Aayurveda medicines. Even then many used to say Deshi medicines are useless for Vaidyam. In such circumstances running the industry became very difficult for the Vidyaa-vetta. “will we sell spoilt medicines just because we will get loss? Let us get loss. We will never do this adharma-kaaryam. Aayurveda Shaastram says the more Dharmam is followed, the better the Aushadhams work. So never even think about doing such Shaastra-droham”. All the medicines were thrown out. Many later congratulated the Vidyaa-vetta for his nishkapata-buddhi (honesty). Later that Vyavasthaapaka became a big Shaastra-vetta, Vaignyaanika. He is none other than “Aachaarya Praphulla Chandra Rāy“. Puraanam itself means “even though old it is new”. The more one reads them, the more his Gnyaanam will increase. Even though everyone knows the story of Raamaayanam, every time they read, new things are understood. The importance of Puraana-shravanam is well shown in the story. Even though the couple in the story did great Punyam and got Daivatvam, just because they never did Puraana Shravanam, with Ahankaaram they used to make fun of others. If Puraanams are so valuable for Devatas themselves, then imagine how great they are for us, that too in this Kaliyugam! The greatness of Paropakaaram in shown in the story. Just because the two Vrukshas gave Phalams to people who are in need of them, they got Vimukti. There is no greater Sadgunam than Paropakaaram. In Paandya-desham, there was a Nagaram by name Shri Valli Puttuur. It had very tall Bhavanams which touch the skies, all people used to follow their Sva-dharmam. There were many Pushkarinis and Udyaana-vanams (huge parks). The Sarovaras were filled with big Padmams and had many Hamsas. All the Nagara-maargams (roads) were wide and straight. Words are not enough to describe the Soundaryam of the Nagaram. After Jala-kreeda in Sarovaram, the women used to take Shuddha-jalam in pots for Shri Hari Abhishekam. The also used to take Kamalam and other Pushpas for Vishnu puuja. Later they used to do adhyayanam of Bhaagavata-aadi Puraanas. Ducks sleep with their heads covered in their feathers. Seeing them, some used to think they are the Vastrams (white clothes) of the Vipras who did snaanam in the Nadi before Suryodayam and enter the water to return them back to the Vipras. The ducks, disturbed from sleep, used to then go away from them. Instead of praising them for their honesty, the Baalikas who saw all this used to laugh at them. The main Devaalayam of the Nagaram was that of Mannaaru Krishna Svaami. It is on the Northern side of the Nagaram. There were two huge Rathams for Krishna Svaami which resembled Meru and Mandara Parvatams. The Gruhasthas in the Nagaram, on seeing an Atithi, used to do Saashtaanga-namaskaaram. Then they used to take them to their Gruham, wash their feet, always remembering that “Abhyaagatah Svayam Vishnuh”. After the Atithi took some rest, they used make him sit on a mat made of Naarikera-patrams (coconut leaves) and put aahaaram in a Vishaala Kadalii-patram (plantain leaf). They used to serve rice (Odanah) made from best quality grains (tandulaah), Daal, Go-ghrutam (Cow ghee), many varieties of Vyanjanams (curries), Go-ksheeram (Cow milk) and Go-dadhi (curds). After the Bhojanam, they used to give the Atithi Taambuulam and do their Paada-seva. As soon as the Atithi says “ok, I must go”, they used to do satkaaram to the Atithi according to their Sampada, go along with him for some distance and come back sad to have got only that much chance of doing Atithi-seva. In such Shri Valli Puttur Nagaram, in the 46th samvatsaram after the start of Kaliyugam (that is around 5000 years ago, see this too), Svaatii-nakshatram, was born the great Bhaagavatottama Bhattanaatha (Bhaṭṭanātha), with the amsha of Shri Garuda Bhagavaan. For him, Kashtam and Sukham were both same. Before doing Vidyaabhyaasam also, he had Gnyaanam and Vairaagyam. He was a parama-Vishnu-bhakta. Impressed with his Bhakti, Mahaavishnu started to make Bhattanaatha’s hrudayam as His nivaasam! Hence everyone used to call Bhattanaatha as “Vishnuchitta”. The Atithi-seva tattvam of Bhaarateeyas is well shown in the story. They consider Atithi as Vishnu. The unnata-samaajam of Bhaarata-desham is well shown in the story. They were always near to the Nature, followed their Sva-dharamam and always did Daiva-chintanam. If we read Amuktamaalyada, from which this series of stories will be taken from, or ShrimadRaamaayanam, or Raghuvamsham, we will find descriptions of how well the cities of those days were developed. Once we contrast with the present “modern” city we will really come to know whether we have really made “progress, development” by leaving our Bhaarateeya Smaskruti and Saampradaayam and copying the West?